5/29/2010 – It's been many days since we last touched on the subject – the upcoming election to FIDE President, which pits the incumbent Kirsan Ilyumzhinov against challenger Anatoly Karpov. The latter has had a campaign site in operation for a while now, Ilyumzhinov has launched his own under the name One FIDE. Meanwhile international press organs are having a field day. Links and excerpts. 2010 will prove to be another important year for FIDE as we look forward for the next four years and review our previous achievements. On our web pages, you will find a comprehensive review of our achievements as well as our electoral program and direction for FIDE. This vision is part of a long term strategic thinking process and it has been fundamental for the success we have had these last fifteen years. The campaign management, as well as running FIDE, is a team effort not a one man mission. We open our arms to anybody who wishes to contribute ideas, or volunteer their services. Over the next four months, we will openly discuss issues, criticism, suggestions and generally anything which can help the chess world and everybody inside it, become more professional. We will continue to practice democracy and ensure that everybody has an equal voice in the development of FIDE. Which side are you in the dispute between Karpov and Ilyumzhinov? I do not have any specific preference at the moment. Maybe, because I don’t know the situation very well. Everything is taking place in Moscow and I am in St. Petersburg. But, I think that the criticism addressed to the incumbent President is deserved. However, things are not black and white when describing this situation. There are pluses and a few minuses in Ilyumzhinov’s work. The other thing is that the great chess player Anatoly Karpov has no program in the election, which does not inspire any confidence or trust. In fact, instead of a program, he is just making promises. Words, words, words… It is absolutely not clear what the future holds for us. With Ilyumzhinov, when problems arise, he reaches in his own pocket, gets money and solves them. With Karpov, it is absolutely unclear for me how he would solve the problems. He is referring to some sponsors, and keeps repeating: “there will be sponsors, there will be sponsors...” But, he does not name a single specific sponsor. Why is this such a great mystery? I am at my loss. Anatoly Karpov and all of us on the Karpov2010 campaign team are proud to announce that the renowned entrepreneur and chess patron Dato’ Tan Chin Nam has joined the Advisory Board of the Karpov2010 campaign! His life in chess began nearly 40 years ago. High points include reopening China in the 1970s to outside chess influence and bankrolling the Big Dragon Project to develop Asian chess. He provided funds for the First Asian Masters Circuit, the 1984 USSR vs. the World Match, the Tan Chin Nam Cup tournaments in China, two China – USA Summit Matches, and the ongoing 1,000-plus-player annual Malaysian Chess Festival. More details on Dato’ Tan’s remarkable business career are included in a brief bio on the Advisory Board page. Is the Battle for the FIDE Presidency About Chess, Politics, or Big, Big Egos? Anatoly Karpov, chess grandmaster, former world champion and diligently a-political public figure, has found himself on a collision course with the Kremlin over the future of world chess. By standing for the Russian nomination for World Chess Federation (FIDE) president he has challenged the incumbent, President of the Republic of Kalmykia Kirsan Ilyumzhinov, and clashed with his ally, the high-ranking Kremlin aide Arkady Dvorkovich. For newsroom editors across the world, the idea of Karpov “battling with the Kremlin” for the future of world chess was too good a headline to miss. But this struggle seems to be less about politics than about personal prestige, allegiances and somewhat opaque business relationships. The scandal – by now well documented in the Russian and Western press – erupted on May 14, when the Russian Chess Federation (RCF) met in Moscow to elect its candidate for president of FIDE – the sport’s governing body. A meeting of the RCF’s governing council at its usual venue elected Karpov. But Dvorkovich, who is chairman of the RFC’s advisory board, had already announced in April that Ilyumzhinov would be the Russian candidate. He immediately claimed that the meeting lacked a quorum and Karpov’s nomination was therefore “illegitimate.” Days later, personnel from a private security firm carrying a document signed by Dvorkovich evicted Chairman of the RCF Alexander Bach from his office and closed the group’s headquarters in Moscow. Without warning, guards sent by a senior Kremlin adviser took over an elegant pre-revolutionary mansion in an upscale neighbourhood of Moscow here last week. The tenants were told to leave immediately. The Russian Chess Federation, it seemed, was under siege. The incident was the most brazen move so far in a bitter struggle for control of a game that has been dominated by Russians for decades and is still a source of national pride. But Russia's pre-eminence has dwindled in recent years along with interest in the game generally, and the fight is over how to reverse the slippage and re-establish Russia's authority in the chess world. The conflict has pitted an alliance of two former world champions and one-time enemies, anti-Kremlin activist Garry Kasparov and Mr Anatoly Karpov, against high-ranking Russian officials. Mr Karpov shocked Russia's chess world earlier this year when he declared his intention to seek Russia's nomination for the post of president of the World Chess Federation – against the candidate handpicked by the officials. Fide, the International Chess Federation, holds its five-yearly presidential election in September and it is turning nasty. The incumbent since 1995 is Kirsan Ilyumzhinov, controversial ruler of Russia's semi-autonomous Caucasian state Kalmykia. In his early years as Fide president Ilyumzhinov built a 'chess city', made the game mandatory in Kalmyk schools, and financed grandmaster chess so generously that his dubious human rights record and eccentric claim to have met "humanoid aliens" were shrugged off. But recently Fide's excessive reliance on ex-Soviet tournament venues and an autocratic rule change where a player loses if not seated at the board at the start have provoked a deluge of criticism. Ilyumzhinov will be opposed by Anatoly Karpov, all-time world No. 3 and backed by Garry Kasparov, all-time No. 1, abortive challenger for the 2008 Russian presidency and a fierce Kremlin critic. K and K, supported by the current world No. 1 Magnus Carlsen, held a fund-raiser in New York which raised over $100,000 for the Karpov campaign. A similar evening with Kasparov and Nigel Short is planned for Simpsons in the Strand, London, in August. K and K believe they can attract more Western sponsors to chess. Many Western chess federations including the US and England have announced support for Karpov but Fide has 161 member nations, not far off the 200-plus of Fifa and the IOC, and Ilyumzhinov has won the last three elections with the help of sweeteners to third world delegates. Karpov is famous enough to turn some small countries his way, but the vote will be during the biennial team Olympiad at Khanty-Mansiysk in Siberia, a favoured Ilyumzhinov site. An ugly fight for the Russian federation vote shows that the contest has a wider significance than just for chess. A majority chose K and K but a rival group led by the economist and presidential aide Arkady Dvorkovich first claimed a technical win then sent in security men to evict the pro-Karpov officials. Kalmykia's strategic position and its oil and gas, plus Kremlin hostility to Kasparov, may prove a key to this bitter contest. What is currently going on at FIDE can be compared with star wars, all the more so given that certain of the participants, according to their own claims, have experience of dealing with extra-terrestrial civilisations. At the epicentre of the scandal we have some of the greatest grandmasters and the Russian political elite. Such are the circumstances in which the chess world is choosing its president. As is well-known, Kirsan Ilyumzhinov, head of the republic of Kalmykia, has been president of FIDE for 15 years and is hardly likely to go without a fight. Probably he has his reasons for this – for example that his high position in the FIDE helps to maintain his status in the regular distribution of gubernatorial posts. He is opposed by Anatoli Karpov, also an active political figure, who has always been in high political favour – first with the Soviet government, and then the Russian authorities. On 19 May, when Karpov was in New York and about to give an interview to our paper, he suddenly received a cal from Moscow and was told that the Botvinnik Central House of Chessplayers had been surrounded by armed men who had produced a letter from Arkady Dvorkovich, an assistant to the president of Russia, and also Chairman of the Supervisory Board of the Chess Federation of Russia, authorising a change of guards. According to Karpov, the men seized all office equipment and went into the computers of employees, with no judicial decision, nor any other legitimate rights. Anatoly, do you believe this action was a reply to your recent event in New York, aimed at raising funds and votes, in support of your bid for the FIDE Presidency? 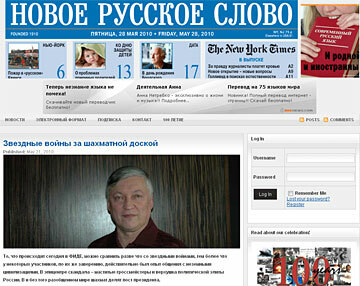 Karpov: Of course. Arkady Dvorkovich has long since crossed the border of reasonableness, but nevertheless the introduction of armed men into battle – this is a serious moment. He wrote a letter of appeal to all FIDE members. Just as Lenin, to administer the revolution, seized the post office, telegraph and telephone system, so Dvorkovich, in the name of the Russian Chess Federation, appealed to other powers, claiming that Karpov, Kasparov, and Bach do not represent the Russian Federation, but that he himself does. You mean he just nominated himself? Yes, himself, the sole ruler. And what is amazing, is that he signed a letter that the decision of the Supervisory Board, which was held in Moscow, is illegitimate, since they allegedly have not yet registered with the Ministry of Justice. So the meeting which was held did not have any right to take decisions, because registration had not been completed. That is, in the first half of the letter he says the board has no rights, and its decisions are illegitimate, then later on, he signs the letter in his capacity as Chairman of that very Supervisory Board! Incidentally, according to the ordinance, the Supervisory Board is an advisory body, and the chairman cannot seize power and represent the Federation. Nobody gave Dvorkovich such authority. What connection does Dvorkovich have with chess? Unfortunately, in February, we elected him chairman of the Supervisory Board. He is in chess a new man, but his father was a famous arbiter, who for many years worked as a manager in Kasparov’s team. And he grew up, so to speak, in an atmosphere of great dislike of me. But what is happening now – your long-time opponent Kasparov is on your team? How did this come about? It is the result of having 15 years of the same group of people in power, who are not prepare to go. So now this battle unfolded. I do not know why Ilyumzhinov needs this job, what he sees in the chess federation – maybe a cover for some of his other activities? But all the same, he leads one of the poorest republics in Russia. Where is he getting his money from? There is a view that FIDE only still exists because of Ilyumzhinov. This is a myth. Take the Chess City Olympic village. It was built with money from the budget, not from Ilyumzhinov, and has no connection with chess. It was never the property of FIDE, it is a holiday centre belonging to Kalmykia. And if you look at the financial documents of FIDE, there is not trace of money from Ilyumzhinov. Today, FIDE is very poor, its best annual budget is about one and a half a million euros. For an international federation, this is nothing. Yet Ilyumzhinov claims he has spent more than 50 million dollars. Is this somehow reflected in the financial documents? No, it is impossible to find this in the documents. To have spent such money, you’d have to have led the Federation for 25 years, not 15. There is no trace of Ilyumzhinov’s money to be found in the Federation’s documents. But this myth has been created that he has spent so much of his own money. Tell us about your programme, your plans in the event that you succeed in becoming president of FIDE. I think now it is first necessary to establish the work of FIDE. It does not take into account the Internet. The spreading of the game of chess is at a very low level. We have many trump cards with which you can apply to companies. I have never seen some serious booklet of the International Chess Organization, and firms simply do not want to deal with this team, which has such a tarnished reputation. Initially Ilyumzhinov tried to establish something in the West, but it did not work. Now he is up to some other secret doings. In Russia, he can still achieve something, but abroad, he is known, and that is even worse. How are you going to attract capital? Chess has many possible sponsors and partners. There are millions of chessplayers in the world. On the Internet, more than a million games are played every day. I have one interest – to save chess as a profession. Dvorkovich is now preparing to represent Russia in an idiotic light – and this is the representative of the presidential administration! Firstly, what he has done is unlawful, of course. Secondly, it is a usurpation of power. Russia is supposed to be going down a different path, according to Medvedev and Putin. We want to be a civilised country, but when you start to carry on in such a fashion, it gives rise to the question: who is winning in Russia? How do you think events will develop further? We will, I think, see an extension of intimidation of delegates – this situation already existed in 1994, but then Russia was a bandit country. Then it was dangerous to walk on the street. Could you be nominated by another federation? I have been nominated by four other federations, I can go with any one of them. What can prevent you winning? Power methods. We are all alive, and nobody wants problems and threats from security officials. There have also been threats to delegates, and blackmail and bribery. It's a worldwide disgrace. The decision on my election was adopted by 17 votes out of 32. We were reporting live from the scene, attended by about a hundred people. But somewhere in a private apartment seven people got together, headed by Ilyumzhinov and Dvorkovich, and decided otherwise. And then they claim that they are legitimate, and we are not. As a result, now the president of FIDE will be chosen by delegates of 169 federations that are members of this organization. But I am confident that we will win. People's opinions matter. If in Russia now, there was no Internet, which is almost universal, there would have been orders issued not to write about it, not to show it on television – as indeed was done in the old days, when orders came from above. Now there is feedback. People can express their opinions, and then there is a reaction. When hundreds, thousands, millions have expressed bewilderment and protests, it begins to have effect. 21.05.2010 – Last week the RCF nominated Anatoly Karpov as their candidate for the Presidency of FIDE. This was verbally contested by the supporters of incumbent Kirsan Ilyumzhinov. Today black suited men from the private security firm “Peper” arrived at the Federation’s offices, kicked out the regular security guards and sealed off some rooms in the building. Report in True/Slant + Karpov's reaction. 22.05.2010 – The battle for FIDE presidency is getting more vicious. Leading the battle on the side of Kirsan Ilyumzhinov is the President of the Turkish Chess Federation, Ali Nihat Yazici, who has published a number of pieces on the TCF web site against challenger Anatoly Karpov. In his latest piece Yazici states his reasons for switching from opponent to friend and ally of the incumbent President. Excerpts and links. 26.05.2010 – Any idea which are the most active chess playing countries in the world? Did you know that 43,000 people in the world have a 2000+ rating, while around the same number are rated below that mark? The top seven countries have the same number of players as the remaining 136 members of FIDE? The French Chess Federation's Léo Battesti presents us with some eye-opening statistics.